Somalia President Hassan Sheikh Mohamud topped off attendance at the historic U.S.-Africa Leaders Summit hosted by President Obama with a visit to Harrisonburg, Virginia, on Aug. 7, where he renewed 13-year-old ties with Eastern Mennonite University and its Center for Justice and Peacebuilding (CJP). 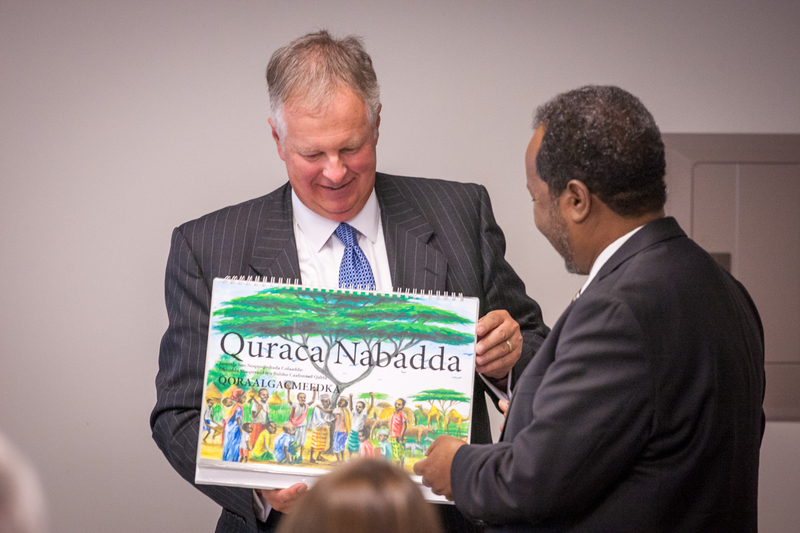 EMU President Loren Swartzendruber presents Somalia President Hassan Sheikh Mohamud with materials produced by EMU for trauma-healing work in the Somali language. The young of Somalia need trauma healing, education, and work opportunities in order not to be vulnerable to recruiting by terrorist organizations, he said. Mohamud arrived in Harrisonburg in a mid-sized black car sandwiched between two other black vehicles, with accompanying members of the U.S. Secret Service. 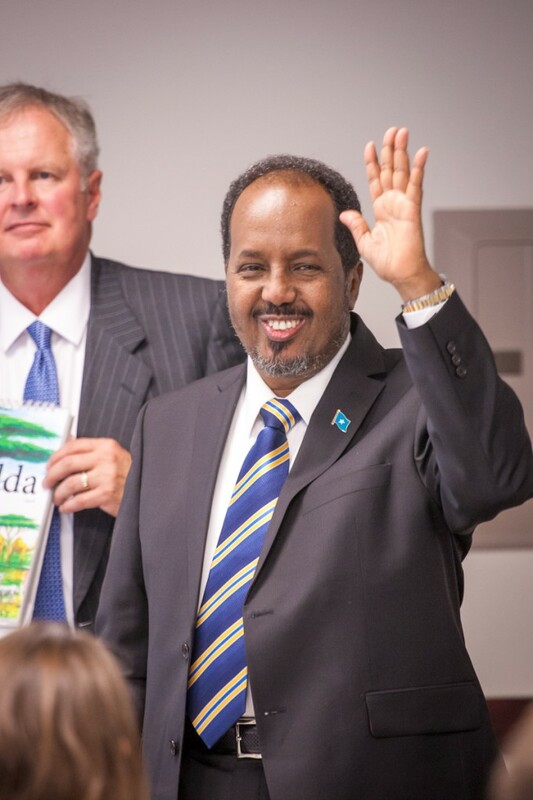 “We are always honored when our former students return to campus, [but] to my knowledge, you are the first Summer Peacebuilding Institute alumnus to return with a motorcade,” said CJP executive director J. Daryl Byler in his welcoming remarks, evoking a warm smile from the Somali president. President Mohamud departs, assisted by U.S. Secret Service members. After Ali began studying at CJP in the late 1990s, she recommended EMU’s Summer Peacebuilding Institute (SPI) to Mohamud, who was then an educational leader in Somalia. (He is the founder of what has evolved into Simad University in Mogadishu, with 5,000 students.) Mohamud took three of SPI’s intensive courses in 2001, focusing on mediation, trauma healing, and how to design learner-centered trainings. “My brothers and sisters,” he said, recalling his time at SPI, “this is another great day in coming back here after more than 10 years away.” Since Mohamud’s time at SPI, more than a dozen Somali men and women have attended SPI, plus many others who have Somali roots but enroll in SPI from Kenyan, U.S., or other addresses (SPI does not track its participants by ethnicity). “The tools and the instruments that I took from here helped me a lot in sitting with the people, having the patience and the endurance to listen to sometimes irrational arguments,” he said. Fortunately, Mohamud said, his SPI training helped him to realize that the people speaking irrationally and often choosing destructive paths were burdened by psychosocial traumatic baggage as a result of their constant exposure to violent conflict. Unfortunately, he added, Somalia remains a tinderbox. A destructive act by even one person can undermine years of efforts at peacebuilding and reconciliation and spark widespread attacks of one group against another. In this environment – with Somalia’s still-weak, distrusted governmental bodies – the terrorist group Al-Shabaab has played a viciously destabilizing role in Somalia and indeed the entire region, Mohamud said. Members of this group tried to kill Mohamud in a hotel assault four days after he became president on Sept. 10, 2012, and have launched other attacks on him over the last two years, sometimes killing people around him. Kaltuma Noorow is hugged by President Mohamud. The meeting was held in an area that could be easily secured by the Secret Service and local police. Twenty-six representatives of EMU joined Mohamud and his accompanying group of eight for remarks and lunch at The Gathering Place, a relatively secluded meeting area on the back side of Common Good Marketplace, near the southeast corner of EMU’s campus. Mohamud singled out Kaltuma Noorow, a rising junior at EMU, for special attention at the luncheon, giving her a warm hug as he departed. He praised her deceased mother, Dekha Ibrahim Abdi, a Somali-Muslim renowned for her peace work in East Africa, for insisting that the “cross-cutting subject” of peacebuilding be woven through the required coursework of all students at Simad University. As one of three who spoke on behalf of EMU, Byler explicitly referred to the interfaith nature of EMU’s work with Somali-speaking people, who are largely Muslim. Byler quoted two passages from the Holy Quran that “whoever saves a life, it is as though he had saved the lives of all humankind.” And: “Have you seen him who denies the religion? He is the one who harshly rebuffs the orphan and does not urge the feeding of the poor.” Byler offered Psalm 82:3 as having a similar message for Jews and Christians: “Give justice to the weak and the orphan; maintain the right of the lowly and destitute.” The Somali president nodded in affirmation as Byler spoke these words. As a sign of CJP’s commitment to Somalia and the rest of the Horn of Africa, Byler said CJP is establishing its first “practice and learning hub” to “partner with and support our [East African] alumni as they engage in this challenging work” of addressing the deeply rooted, systemic problems that feed the cycles of violence. EMU President Loren Swartzendruber presented the president of Somalia with several gifts, including training materials in the Somali language used by EMU’s Strategies for Trauma Awareness and Resilience program. A fine example of the impact EMU is having at an international level with CJP which crosses religious boundaries. What a remarkable man, and what an honor to have him so connected to EMU! A great opportunity and another resounding affirmation for the important work of EMU CJP!